Global Mascot Makerss is one of the world’s leading manufacturers of Mascot Costumes. It is not just creativity, which gives our character mascots heart , it’s that twinkle in the eye and saucy grin which turn a GMM mascot into a crowd-pleasing, huggable mascot costume. Just like any investment, it is important to do your research and planning to ensure that you get the most out of your character! Start with an idea, or no idea at all! Bringing your character to life can start in many ways… some may start with a graphic of a character or logo that is already used in branding, while others may begin with the crayon drawings of a child. Some clients have an existing mascot costume that they want redesigned or duplicated with only minor changes. Mascots take many forms. Examples include branded mascots being the embodiment of a company logo, a product, a furry animal design or an inanimate object. Global Mascot Makers are Costume Specialists and creators of Mascot Costume. We do leading character & promotional mascot costumes to give your brand unlimited eyeballs. We are ready to make your Brand Mascot a STAR! Our custom corporate mascots, walkabouts, and costume characters are present globally for companies across all Sectors, attracting attention and building revenue in a fun and memorable way. We Build Character! From FMCG to banks, to conventions, to story time at the library, characters from Global Mascot Makers are seen and appreciated everywhere just because our customers know they can count on us. You know our custom mascot characters as the familiar icons and friends that you have seen everywhere; including television networks, films, sports events, amusements parks, sales meetings, trade shows, food chains, financial institutions, book signings, product manufacturers, schools, fairs, safety education programs, and more. 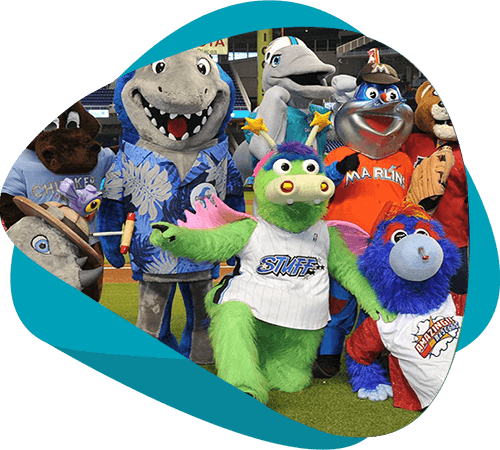 Surveys have share that mascots are an excellent tool for enhancing your brand’s reliability and spreading awareness about your brand. Companies have made Facebook pages for their mascot and have received enumurous likes like never before! Brand mascots have taken the role of the ‘spokesperson’ with their own Facebook pages, and eventually more appealing & promising than the brand’s page. How recognizable is your mascot? Is he a household name? or is he a recently conceived idea? If he’s brand new, think about mediums that will help you drum up awareness and excitement for your character. If he’s a household name, start thinking about additional ways to keep him in the spotlight! You can run activations and contest where you send your brand mascot or Cartoon mascots to kids first birthday party / Special family event engaging kids and families and create a higher Brand recall. This kind of events and promotion brings personalize touch with your clients and surely gives you repeat business. Weaving your current BTL /promotional activities around mascots are highly recommended from branding & marketing perspective as again it fetches highest social media reach and brand recall. Brand mascots can build engagement even more effectively with mobile and social media. They can help to build relationships and amplify emotional connections. We’ll hand-hold you through the experience of buying your first mascot costume to executing its presence in all the events that you wish to participate. At Global Mascot Makers we know that having a mascot is much more than just owning a costume. As a result, we offer a wide range of support services, from costume cleaning and refurbishment to storage solutions to performance training – all geared towards helping maintain your mascot to ensure that you get the most out of your investment. If you are planning a grand unveiling of your mascot – perhaps in front of media or at a high profile event – and would like the help of GMM to supply a performer to portray your mascot for this, or additional, one-off events, please let us know. We work with a number of clients on this basis, leaving them free to focus on their wider events.